Stay-and-play packages: $269 (per person, per night); Monday and Tuesday, $319 special, 2 nights lodging, unlimited golf, four persons. It's always best to go easy on the superlatives. Otherwise, you cheapen the impact when they are justified. I'm perfectly comforable throwing around superlatives when it comes to Forest Dunes Golf Club. 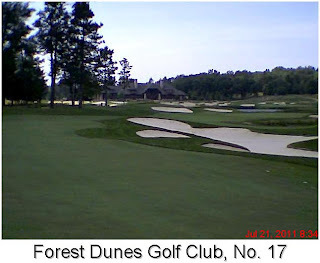 Designed by Tom Weiskopf and open since 2000, Forest Dunes is a great golf course. Tree-lined on the front nine and links-y on the inward nine, it's a feast for the eyes and a stern but fair test of your game. Yes, it's off the beaten track in upstate Michigan, about 2 1/2 hours north of Detroit and six hours from Northeast Ohio. Is it worth the long-ish ride to pit your game against Weiskopf's design? In my opinion, heck yes. The price of stay-and-play packages at Forest Dunes puts those packages at the outside edge of the "Affordabili-TEES'' envelope. But there is real value in them, from the super-sharp houses on site where stay-and-players stay to a truly special golf course. I'll share more thoughts about Forest Dunes in a story that will run on Aug. 14 in the Travel section of The News-Herald.